Whether you believe in ghosts or not, there is no denying that there is something special about visiting a historic place that has laid witness to generations of human experience – from joyous celebrations to tragic losses, and everything in between. You can’t help but feel a deep connection to the obscure energy emanating from the antique furniture, dilapidated woods and historic architecture. One of my favorite ways to bathe in the eerie goodness of history is to stay overnight in a haunted hotel. I love hearing about the stories of those who have checked in before us, and those, who for one reason or another, decided never to leave. Luckily there are plenty of haunted hotels in California, and specifically, in the city of San Diego. This is just one of the reasons why San Diego is our all-time favorite city for a weekend getaway. 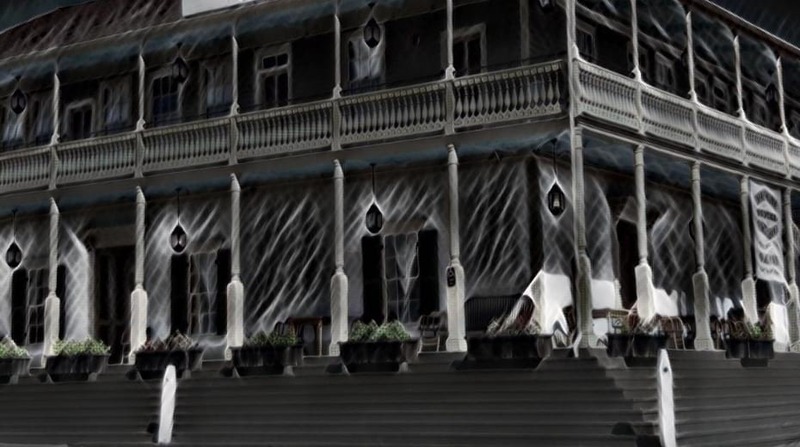 And since we have experienced many of the haunted places in San Diego over the years, we decided to write this article to share with you our 3 favorite haunted hotels in San Diego to help you plan your next creepy visit to the birthplace of California. Standing proudly at the Northeast corner of Old Town San Diego’s historical plaza, the Cosmopolitan Hotel was once the grand home of Juan Lorenzo Bandini. He had made a fortune in the Mexican cattle ranching industry and wanted a home that reflected his social standing in the community. The original structure was built in 1827 as a single-story adobe ranch-style home by natives from the local mission. Casa de Bandini was the happy home and site of many social gathering, like fandangos, the Bandini’s popular dance parties. However, due to a changing economy and California becoming a state, Bandini’s fortune dwindled and in 1869 his son-in-law sold the property to Albert Seeley. Seeley remodeled the adobe ranch-style home into the two-story Greek revival Cosmopolitan Hotel, complete with a wrap around balcony that not only continues to be popular with current guests, but with past spirits as well! Since then the Cosmopolitan San Diego has seen many changes in ownership including Bandini’s own grandson, Cave Couts Jr, who owned the property in the 1930’s. Named a state national landmark no. 72, the hotel was revived into its 1870’s glory while maintaining some pieces of the original structure, like the floorboards, wainscoting, window and door frames, as well as some adobe. Now owned and operated by Old Town Family Hospitality Corp, the Cosmopolitan Old Town remains a fully functioning hotel that is known for welcoming guests – both dead and alive! 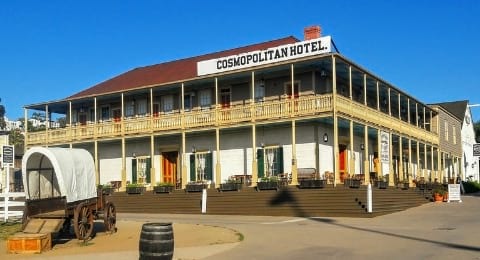 The Cosmopolitan Hotel has been recognized by the paranormal community as one of the most haunted places in San Diego, which is saying a lot because just around the corner in Old Town is the infamously haunted Whaley House. You can read more about the Whaley House HERE. Bandini family members, kids and even natives are rumored to still be wandering the halls of the Cosmopolitan. 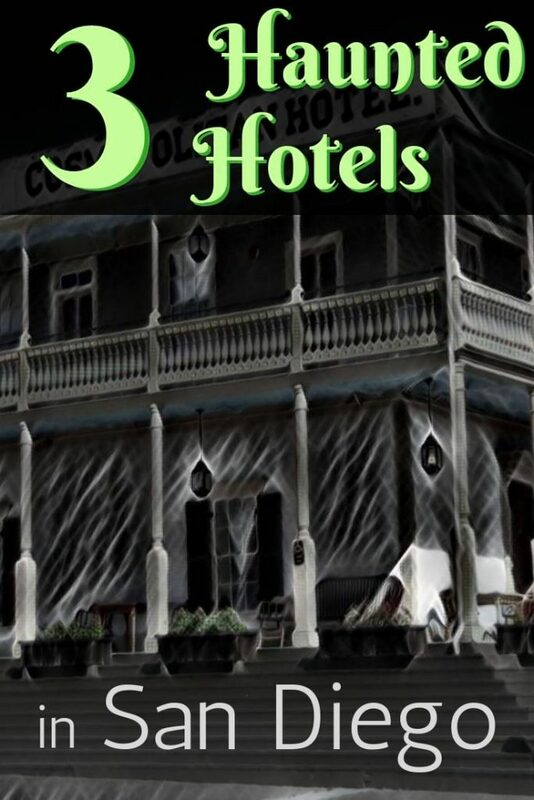 However, many of these haunted hotel stories are just rumors with no historical evidence to back them up. Allegedly the most haunted hotel room on the property, room 11 is thought to be haunted by Bandini’s youngest daughter, Ysidora. There was a story going around that Ysidora fell to her death from the balcony outside room 11, but that story actually appears not to be true. For one, neither the second story nor the balcony existed during the time of the Bandini’s residence. Secondly, Ysidora didn’t die on the property and lived until the age of 67. However, she did visit the hotel and was known to prefer room 11. So, it is possible that her spirit likes to check in every now and then. This room is another hotbed for activity with lots of stories circulating around the room and its furniture. There is no doubt that there is activity going on in the room. There are some rumors about the furniture in the room. There is a story that the carving on the headboard is of a little girl that died tragically and the carving on the adjacent dresser is the face of the mother. But…that cannot be validated as no one knows the origin of the furniture as the pieces are not known to be original to the property and were acquired during the most recent renovation. We do know that the carvings do not represent members of the Bandini family. There is one story, though, that has been reinforced over and over again, which is the presence of the Lady in Red. A local medium channeled her spirit on the balcony outside room 4/5 waiting for a gentleman. Some speculate that it may be a lady of the night. However, she appears to have a lighthearted and feisty personality so don’t be scared. Across the San Diego Bay sits the historic Hotel Del. 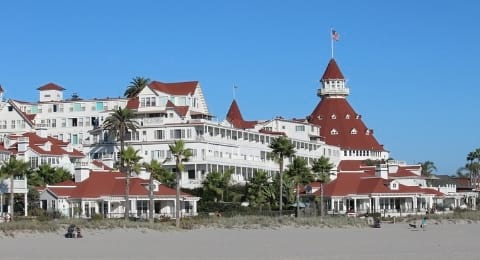 Built in 1888, this beach front resort was the largest resort hotel in the world during that time and continues to be the second largest wooden structure in the United States. A real swanky place, the Coronado Hotel San Diego has been a home away from home for many celebrities, presidents and royalty for 130 years. Amazingly, this national historical landmark is still rated among the top ten resorts in the world to this day – an incredible feat considering the competition that has grown over the years since it was built. The Del has been featured in several movies, most notably “Some Like Hot” starring Marilyn Monroe. It was even used to house pilots in training at North Island Naval Air Station as well as their families during World War II. 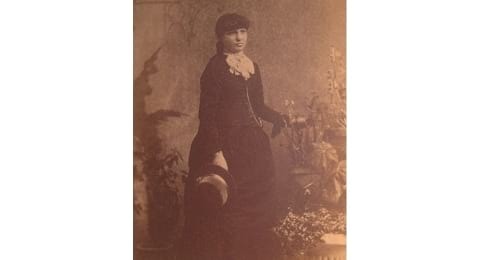 Kate Morgan was only 24 years old when she checked into The Del on Thanksgiving Day 1892. Sadly, poor Kate would never check out and is said to still be hanging around the resort. There has been some speculation that this was a homicide rather than a suicide as the bullet in her head did not match the bullets in her personal gun. However, the case was never reopened. In addition, some claim that the body wasn’t Kate Morgan at all, but rather a young lady by the name of Lottie Barnard. A recent visit from a local medium, revealed some truths to this theory that have since checked out thanks to a little research. Kate (or Lottie) is spotted frequently around the property, and her third floor guestroom is reportedly a hotbed for paranormal activity. Maybe she is stuck here because of her tragic death, or she may just be annoyed to have been falsely identified all these years. If you are feeling brave, check into room 3327 and let me know about your experience. I am apparently not the only weirdo into this kind of stuff, as her room is the most requested on the entire property! For no explainable reason, the gift shop, which is original to the hotel, has seen a lot of paranormal activity. Things are known to move around and items have been reported to have flown from shelves. For some reason, it is the Marilyn Monroe/”Some Like It Hot” paraphernalia that seems to be of interest to the ghosts. Perhaps they don’t like it hot. Ha! Live music can often be found at the many lounges. Delventure Kids Program that includes mermaid and pirate camps and slime labs! 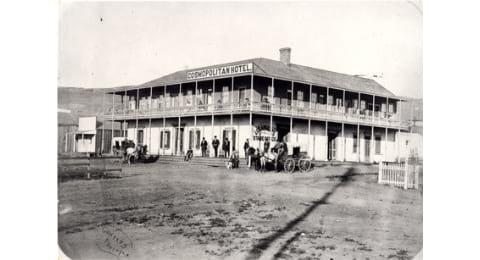 The Horton Grand Hotel San Diego joins two historic 1880’s hotels, the Grand Horton and the Brooklyn-Kahle Saddlery Hotel. 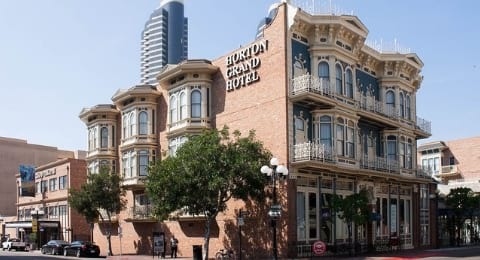 Sitting on the edge of the famous Gaslamp Quarter, The Horton Grand Hotel is one of the oldest historic hotels in San Diego, built in 1886. This was around the same time that Wyatt Earp showed up to San Diego and he spent many years as a guest at the hotel. If you don’t know who Wyatt Earp is, first watch the movie Tombstone and then check out my post HERE. 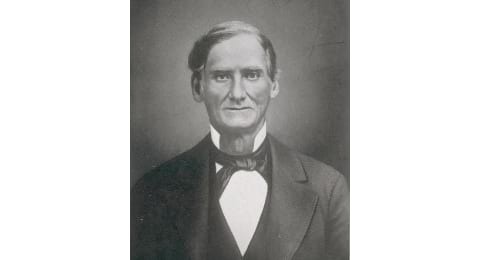 In addition to Wyatt Earp, many other significant figures in society were also guests of the Horton Grand, including presidents, colonels and kings of years past. With so much history, it was a shame when the two historic hotels were on the chopping block to make room for the Horton Plaza mall. Thankfully, a local developer and historical heritage organization saved the hotels, however, by reconstructing them two blocks from their original location. Ironically the area where this grand hotel, oozing with Victorian sophistication, now sits was once a seedy neighborhood known as the Stringaree District. It was home to saloons, gambling halls, opium dens, and brothels. Room #309 is said to be haunted by Roger Whitaker. There are a couple of stories about him floating around (pun intended! ), but the story I find most interesting is the one about him being a gambler in trouble. Apparently, he was on the run because he owed a lot of money to some not-so-friendly guys. Rumor has it that he ran to his room at the Horton Grand and hid in his armoire. Well he didn’t run or hide well enough, because he was found and shot to death in this said armoire. I know it is kind of gruesome, but this is likely the reason room 309 is reported to very active. There are the typical paranormal occurrences like lights flickering, objects moving, and sudden changes in temperature; but there are also some more interesting happenings. For instance, the bed sometimes shakes, an indent of a body is sometimes seen on freshly made beds, and most interesting of all is that when he appears he is described as being so realistic and life-like that a guest even asked him where the ice machine was located. Remember what I said about the former neighborhood being sordid and home to brothels? Well Ida Bailey was a well know Madame and her brothel sat on the exact site that the Horton Grand now sits. She was quite the business women, acquiring high profile clientele and avoiding many of the district’s raids. Bailey has apparently appeared to guests, but by all accounts she is friendly and warm. It sounds like she carried her charm into the afterlife. There have been a number of sightings of apparitions in 19th century fashion floating around the Horton Grand. You know that feeling where you just don’t want your vacation to end? I do. And I suppose these guests feel the same way, booking a long term stay at the Horton Grand Hotel. The next time you visit San Diego you can stay in a regular, predictable hotel (there are plenty to choose from) OR you can check out one of these historical haunted hotels. 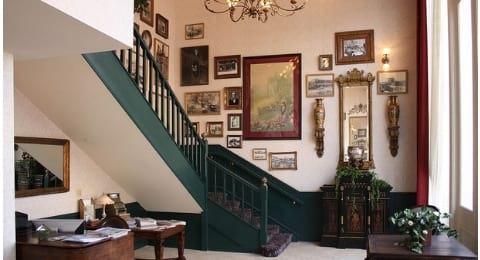 If you are anything like me then you and your family will appreciate the the antique design and dusty historical aura – but more than anything, you will cling to the legendary stories that seem to haunt the place. You never know, something quite unexpected can occur any time you stay at a historical hotel that has seen generations of guests come and go, their personal stories leaving an indelible mark for future guests like yourself to fathom and enjoy. My advice is to go with an open mind and just see what happens. Disclaimer: HotMamaTravel is a participant in the Amazon Services LLC Associates Program, an affiliate advertising program. Amazon and the Amazon logo are trademarks of Amazon.com, Inc. or its affiliates. HotMamaTravel is also a participant in CJ Affiliates program. This means that we get credit for providing awesome advice in helping you book a hotel or decide on a purchase if you happen to use one of our links. There is no extra cost to you, but it helps to support the cost of running our blog. Thank you for supporting us! These hotels are actually lovely hotels and most people have no experiences. It is just for a little spooky fun, but I recommend staying at these hotels any time of the year. What an awesome idea for places to stay. Anytime I stay in older hotels with my kids we always spend some time searching for ghosts. It would be so cool to stay at places that actually have a history of that kind of thing! I used to do that as a kid too, I guess I never lost interest. It is really the history that makes a place special. Did you feel like the Cosmopolitan was haunted? I totally didn’t get the vibe. Maybe the spirits were mellow when I was there a few months ago. The Del… totally. Always beautiful and creepy. I think the spirits in San Diego in general are pretty mellow…they get to live in San Diego. Ha. Not sure I would want to stay in a haunted hotel. 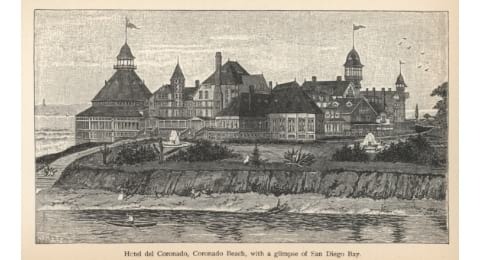 I did visit Hotel Del Coronado once but it was only for a few hours in the day so did not see anything amiss. To me, a haunted hotel just means it has history and that makes these hotels very interesting. Any excuse to stay at the Hotel Coronado– such a beautiful spot! Right! The Del is a destination all its own. I’ve been to two of the three. Haven’t been to the Horton Grand yet. When we stayed at the Del, my son and I went on a ghost hunt. Such a great hotel. How funny, I’ve taken the kids on ghost hunts too when we stay at haunted hotels. Definitely, the Coronado is worth the risk of a ghost sighting. Haha. Who knew San Diego had haunted hotels? Very cool! I assumed San Diego was more laidback and beachy to have a cool haunted history. Thanks for sharing!